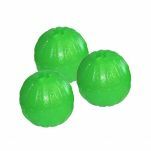 The Starmark Swing n Fling Chew Ball is a virtually indestructible ball designed for flying far and perfect for retrieval or tug of war games with your dog. It is a variation on the very popular Starmark Treat Dispensing Chew Ball. This toy is great to tug, shake, chew and toss. It even floats in water. A ball stronger than rubber! Great for powerful chewers. Free of latex, vinyl, and phthalates. 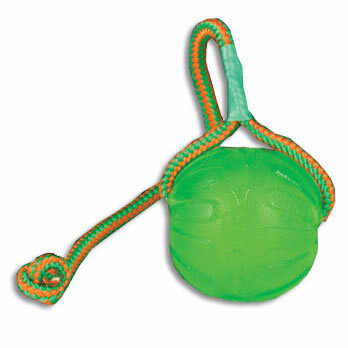 Fun for you to throw and easy for your dog to retrieve. No more picking up the slimey ball! Our ball crazy Apocalyptic x Ridgeback Special loved this instantly! Dissappointingly the rope was broken within about 10 mins (5 min unsupervised) of chew play, but this is easily remedied with new knots and/or rope when necessary. Read 4 customer reviews of StarMark Swing n Fling Chew Ball. The average customer rating is 4. A great toy for a dog who likes to chew and fetch. The ball is fantastic and a big hit, however the rope was chewed through on the first day which is disappointing.